Previously, we wrote about 3 ways to keep track of your SEO Company, and one of those involved Google Analytics. GA is the most powerful tool on a small business owner’s arsenal when it comes to crucial traffic data. 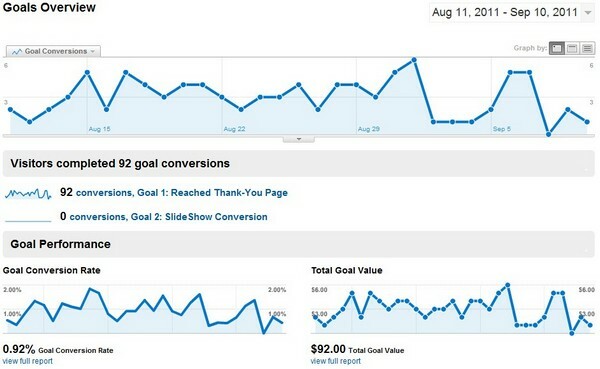 Today, I’ll show you how to track conversions using Google Analytics’ GOALS. This is extremely useful to track all sorts of action on your site – from knowing how many times visitors reach a specific page, to tracking those users that spend more than X minutes on site. For the purpose of this tutorial, I’ll assume you – or your web team – have already properly installed GA on your site. I’ll also assume you have a simple “thank you” page that users can only reach AFTER taking action. We need to talk briefly about the famous “thank you” page. A few years ago, the only way to track conversions was to serve visitors a unique page, such as a confirmation page for purchases, or a simple “welcome to our newsletter” page. In a static location (www.example.com/thank-you.html) or similar. 1 – Log on to your GA and before you click on “view report”, click on “edit”. 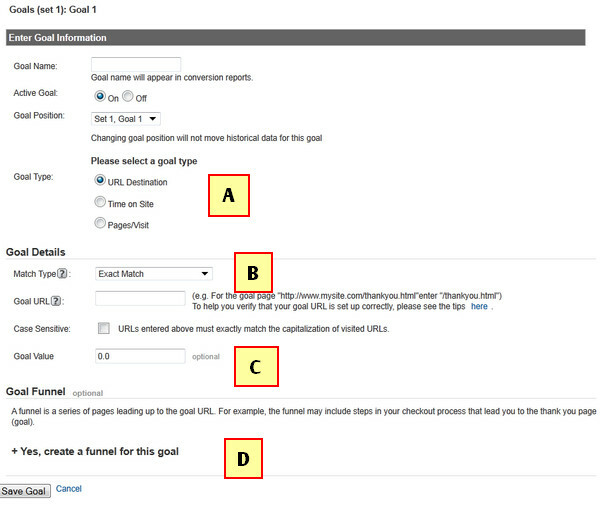 A – For this goal, we’re tracking a URL destination. You could track Time on Site, or # of Pages/Visit. Those are important pieces of data, but not what we want right now. B – Since we’re using a static page, we’ll select “EXACT MATCH”. The other options are applicable only to dynamic pages. GOAL URL – if your thank you page sits at www.example.com/thank-you.html, enter only /thank-you.html. If it’s at www.example.com/shopping/thank-you.html, enter only /shopping/thank-you.html. C – Goal value is easy to set if you’re selling a single product at a specific price. But what’s the value of a newsletter subscription or a lead? This is a bit tricky and it varies depending on your industry, sales funnel, etc..
D – Speaking of sales funnels – if you have a sales process that involves steps like a Shopping Cart, Address, Credit Card Info, Check Out, and Confirmation pages, you can keep track of each step as a part of a sales funnel. GA will give you data to help you analyze behavior step-by-step. Very useful for ecommerce sites. This is how your Goals report will look once it’s fully implemented. So there you have it. Now, you’re able to track how many visitors actually reached each of your “thank you” pages. If you need any help, feel free to ask. Leave us a comment below, most of the time we’re able to give you quick directions and will not charge for it. And if this tutorial helped you, let us know too. Leave a comment here, reply to us on Twitter, or comment on our Facebook Fan Page. Thanks for writing detailed tutorial, Please help me how to track leads that we got through organic visits ? Hi Rameez, you should set up goals in Google Analytics (or whichever analytics platform you use) to track form submissions either via event tagging or by tracking visits to your “thank you” page, the page visitors reach after submitting the form.